If any of the expected points are missing, APAS/Renderer cannot build a model, and your data will instead be shown as cylinders. 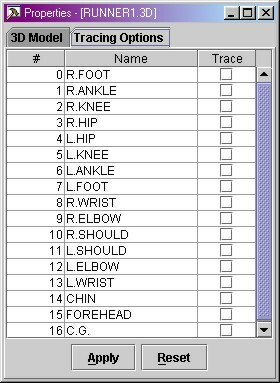 Please pay special attention to the CHIN and FOREHEAD points, since these names were not standard supported in older versions of the APAS Software. Open the CF File and choose "View - Sequence". In the Enter Sequence Parameters dialog box, choose "Segments". Modify the "Joint Name" for each of the points that do not correspond to the above convention. Once this CF file has been saved, it can be played in APAS/ Renderer with full body bone geometry.